Antoine-Jean Gros, 1771-1835, another of France’s famous artists in art history painted one of his most famous paintings "Colonel Fournier-Sarloveze" in 1812. In service to Napoleon he became familiar with famous paintings and artwork by Michelangelo, Peter Paul Rubens, and Anthony Van Dyck. Gros' pose of Colonel Fournier-Sarloveze is similar to the posture of "Charles I Hunting", painted by Anthony van Dyck in 1635. 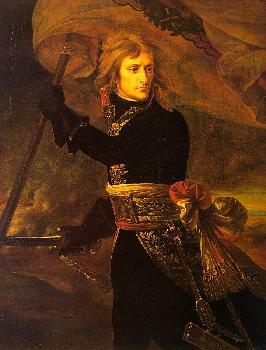 Colonel Fournier-Sarloveze's posture is at ease, strong, confident, daring, and somewhat defiant ready to hold ground with his sword should the occasion arise. Antoine-Jean Gros painted with a more painterly brush, distancing himself from Jacques Louis David and his realistically painted Classical art style. Gros' looser brush strokes gave life to his figures and a more dramatic background. The gold braid, the lining of the colonel's jacket, the strewn papers on the ground are all examples of the artistic alla-prema brush that adds emotional and romantic flair. Antoine-Jean Gros painted the artwork"Christine Boyer", in 1800 is a melancholy painting of a woman dressed in a flowing gown standing alongside a stream in a self-reflecting mood. Gros as a Romanticist developed the emotions and sensibilities of his personalities and did not confine them to the discipline of the rigid Classical art style. In 1804, Gros was commissioned to paint one of his most famous paintings in art history "Napoleon Visiting the Pesthouse at Jaffa". The composition is a hospital created for Napoleon’s soldiers dying of the plague, retreating from a disastrous war in Egypt. Napoleon has touched a tired, naked, dying man, as if he had the power to heal the sick. The dying man unable to stand up, turns his head to view his commander. Gros dramatized the grandeur and monumentality of his artwork changing the hospital into a mosque. He heightened the atmospheric drama moving people in and out highly contrasted light and shadow. Antoine-Jean Gros was a Romanticist given to moods of melancholy and emotion. He had a concern for the tragedy and suffering of mankind. In his artwork he felt melancholy and spiritual torment could be rendered and exalted in human form only when harm was not done to subject matter. Other famous artists of the Romanticism period are Eugene Dealcroix and Joseph Turner. To view gallery #1 of Antoine-Jean Gros paintings click here.